PLANS to renovate and extend the sports pavilion in Peppard may have to be revised. Sport England has raised concerns over the parish council’s proposed £264,000 transformation of the building in Stoke Row Road, which is used mainly by Peppard Stoke Row Cricket Club. The pavilion, which is owned by the council, would have a new roof, large changing rooms, an improved kitchen and better disabled access as well as being more energy-efficient. The club would buy new cricket nets and an equipment shed. Sport England, which advises on sports developments to ensure they are of high quality, is worried about the design of the two changing areas and the showers outlined in the council’s planning application. Bob Sharples, principal planning manager for the quango, said: “There is no screening in the changing rooms, giving line of sight from the outside of the building and also from the corridor that can be accessed from the lobby. “We therefore recommend that screening be incorporated into the design and that the screen area be excluded for calculating the amount of usable changing space in the changing rooms. “A fundamental redesign is required as communal showers are not acceptable for safeguarding reasons and each changing room should be modular and integral. He also said there was no toilet, basin or shower in the officials’ changing area and that he did not recommend officials shared facilities with the players. Outside, he was concerned about the position of the cricket nets, which should have a north/south orientation rather than east/west as proposed. This was to ensure the players’ vision is not impeded by a low sun. Mr Sharples said Sport England was not objecting to the plans but was concerned after consulting the England and Wales Cricket Board. 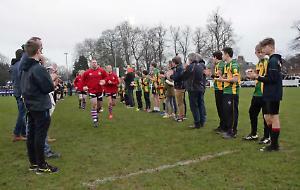 The project would be funded by the parish council, South Oxfordshire District Council, sports funding bodies and fund-raising events and donations. The district council says the new-look pavilion would help increase sporting participation in the area. Cath Dale, participation officer, said: “The existing changing facilities do not meet Sport England requirements for changing room sizes, preventing the cricket club from entering the Thames Valley Cricket League. “Therefore, by extending the facilities, the club will be able to enter teams into the league, thus supporting the club’s development and sustainability. Richard Walker, from Caversham, said: “The changes proposed bring this pavilion and surrounding areas up to date without losing its traditional charm and allows for it to be fit for purpose for future generations. Allan May, from Stoke Row, said: “I believe this is a very positive development for the cricket club. The district council, which is the planning authority, will make a decision by April 23.